They upend the normal healthcare delivery environment by providing healthcare services where the consumers are, in retail environments, as opposed to the normal status of relying on patients to go to the healthcare provider. They are a lower cost solution than the emergency room and can be used both to compete for insurance company business with high-cost ERs and also be used by healthcare organizations to reduce the traffic at the ER. They could help or hurt physician practice. On one hand, they offer better hours on average and do provide treatment for routine services like colds and flus. On the other hand, they they do refer patients - even to the point of suggesting the patient obtain a primary care doctor - and don't provide all services. They are already a source of focus in the in vitro diagnostics industry, as major IVDs develop testing units for both retail and urgent care clinics. They are building consumer awareness and reputation in each additional year of their existence, which is now more than 15 years, with favorable waiting times and hours. As our report indicates, high satisfaction ratings are routinely earned. They are in the forefront of electronic medical records and technology in healthcare, introducing EMR, billing innovation and virtual waiting room technology that physician offices are only slowly adapting to. This report is the most comprehensive look at retail clinics today from a market research firm that has covered retail clinics since 2007 in several reports. The report looks at the situation in the market today, including the amount of locations currently and projections for growth in locations. It also looks at vendor market share and sales that IVD companies and vaccine companies are making to retail clinics, and where those will be in the future. Drug store retail clinic locations have boomed in recent years. Many service providers have established retail clinics. Although many of these clinics may not achieve their expansion objectives, the significant opportunities currently offered by the expanding convenience clinic market suggest that the number of players will only grow and some of these will be successful, according to the report. Furthermore, a similar proliferation of treatment facilities spurred by strong customer demand has occurred in other segments of the health care marketplace, notably the aesthetics market. In 2016, total U.S. retail clinic sales are estimated at more than $1.4 billion, an increase of 20.3% per year from $518 million in 2010. Through 2020, sales are expected to continue expanding. Strong historic growth has been driven by aggressive expansion, particularly by MinuteClinic, which is now owned by CVS. Other brands are expected to follow, according to this report. Retail clinics by nature are designed to occupy small spaces and provide just basic care. Therefore, they do not use most of the sophisticated medical equipment found in hospitals or specialty centers such as advanced imaging devices. However, retail clinics are becoming relatively large users of point-of-care (POC) tests, clinical chemistry and immunoassay laboratory tests and vaccines. In 2015, combined sales of these three types of products to retail clinics reached $240 million, with vaccines accounting for a greater share than POC tests or laboratory tests. This reflects total annual growth of over 26% per year since 2010, when retail clinics accounted for about $75 million in purchases of these products. All three of these products will exhibit solid growth, with total sales of POC tests, clinical chemistry and immunoassay laboratory tests and vaccines to retail clinics accounting for over $618 million in 2020. In this regard, patient flow and throughput are extremely important, since the differentiating factor of convenience clinics that has allowed them to compete so successfully against medical practices has been their accessibility. Low or no waiting times have been a key aspect of this. If the clinics become so popular that waiting times approach those of doctors’ offices, their competitive advantage will be significantly reduced and many consumers could migrate back to their doctor’s office for routine care. This scheduling problem is ultimately one of balancing supply and demand, and is made more challenging by the fact that many of the variables affecting these factors cannot be quickly adjusted. For example, the supply of services varies with the number of clinics in a particular area, their size and staffing levels; contingencies (additional clinics, temporary ramp up in staffing, etc.) cannot be easily established to handle temporary overflows. On the demand side, advertising and promotion can be increased to address lagging consumer interest but if that interest proves too high for the supply of services, adjusting demand downward without creating ill will among future potential customers could be more challenging. Managing growth and ensuring appropriate availability of services will therefore be key, particularly for convenience clinic chains with ambitious expansion plans. It should be noted, however, that as the retail clinic industry continues to develop, many smaller business that are not able to compete with larger chains are closing as consolidation within the industry accelerates. Facilities that have closed or been acquired include Access Health, AtlantiCare, Care Today, MedDirect, My Healthy Access, Now Medical Centers, PFS, Wellness Express Clinics and Target Clinic Medical Associates, among others. As this sector matures, reaction from the medical community will be an important factor influencing public opinion of retail clinic services. Negative reaction could severely impede growth in a number of ways: physician lobbying groups, which continue to be strong, could influence restrictive legislation; on a grass roots level, doctors could generate unfavorable impressions of the clinics with patients as well as the media; negative reaction from the leading medical organizations could affect the willingness of nurse practitioners and others to work for the clinics. Such negativity among physicians could be inspired by impressions of low quality of care, lack of cooperation with the medical community and/or rising competition from the clinics. Lack of cooperation could take many forms, particularly an unwillingness or inability on the part of convenience clinics to share medical information about patients with primary care providers. Since information sharing within the medical community is considered essential to provide appropriate care, a doctor who is not able to obtain treatment or other details about a patient from a retail center is likely to develop a very negative opinion about that clinic. To avoid such problems, the vast majority of clinics has established policies advocating the sharing of medical information, including the obtaining of permission from patients, and has developed electronic systems that facilitate quick transmission of patient files. Competition might be more difficult to address, however, especially as convenience clinics become increasingly popular. Ultimately, medical practices are businesses that rely upon a steady flow of customers (patients) for their success. Physicians are sensitive to this, and in the past have reacted to the emergence of competition in other forms. For example, as practitioners with less and less expertise in cosmetic procedures began acquiring new aesthetic devices in the 1980s and 1990s, the medical establishment continued to react: plastic surgeons objected to usage of the devices by dermatologists, who protested the entry of family doctors and ob/gyns into aesthetics, who in turn tried to prevent electrologists, aestheticians and other non-physicians from acquiring equipment. This chain reaction was caused by a direct threat to each group’s business as device manufacturers ramped up promotion and competition ensued. In general, consumer response to convenience clinics has been strong, spurring the proliferation of clinics through a growing scale and scope of outlets. Kalorama Information’s retail clinic survey found that 54.6% of those adults who had used a retail clinic (about a quarter of the full survey) reported they were "very satisfied" with their visit; 36.3% said they were "satisfied." Only a small percentage, less than eight percent, reported they were "dissatisfied" or "very dissatisfied." Similarly, Wal-Mart has measured customer satisfaction at about 90%. The overall high satisfaction of customers bodes well for the future of retail clinics, suggesting that they meet a strong demand in the market place and are currently fulfilling patients’ expectations. Vaccine sales to retail clinics by type. Healthcare markets have been covered with detailed market size and forecast estimates for nearly two decades. 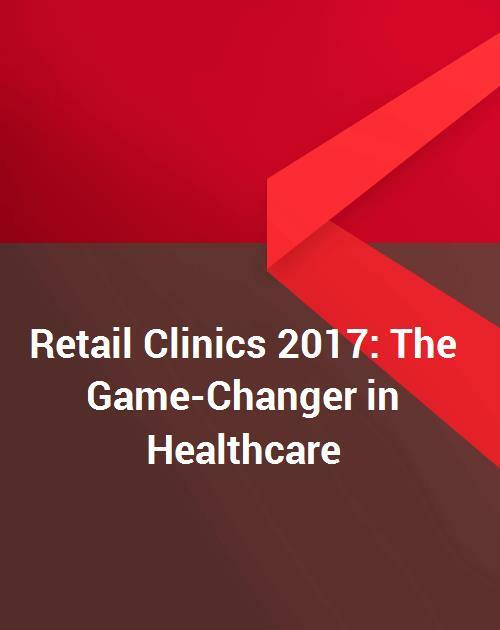 This report represents one of eight reports published by the firm on retail clinics, which they have covered from the concept beginning. Information for this report was gathered from a wide variety of published sources including company reports, catalogs, materials and public filings; government documents; trade journals; newspapers and business press; analysts’ reports and other sources. Interviews with company representatives were conducted to capture the perspectives from industry participants’ point of view and assess trends, and form the basis of the forecasting and competitive analysis. In this report, retail clinics are defined as health care centers that provide basic and preventative care in a retail setting; excluded are crisis and acute care centers; urgent care centers; emergency facilities; and wellness centers. Dollar figures represent the U.S. market and are expressed in current dollars. Sales estimates are provided for the historic 2010 to 2015 period and forecasts are provided through 2020. The size of each market segment refers to manufacturers’ revenues in U.S. dollars. Where full year data is important, estimates from 2016 or the most recent available year are utilized. Chronic Care Patients Still a Moving Target for Clinics. Have You Visited a Retail Clinic? Do You Have a Regular Physician? How Often Have You Visited The Retail Clinic? Where You Satisfied with Your Retail Clinic Visit? Did You Know the Ailment You Had? Information for this report was gathered from a wide variety of published sources including company reports, catalogs, materials and public filings; government documents; trade journals; newspapers and business press; analysts’ reports and other sources. Interviews with company representatives were conducted to capture the perspectives from industry participants’ point of view and assess trends, and form the basis of the forecasting and competitive analysis. In this report, retail clinics are defined as health care centers that provide basic and preventative care in a retail setting; excluded are crisis and acute care centers; urgent care centers; emergency facilities; and wellness centers. Dollar figures represent the U.S. market and are expressed in current dollars. Sales estimates are provided for the historic 2010 to 2015 period and forecasts are provided through 2020. The size of each market segment refers to manufacturers’ revenues in U.S. dollars. Where full year data is important, estimates from 2015 or the most recent available year are utilized.